Stephen Cleobury wields the mighty Harrison & Harrison organ of King's College Chapel in Cambridge following its extensive overhaul in 2016. It is thought that there were two organs in King’s College Chapel as early as the 1530s. Records show that two small organs were moved from a temporary Chapel used during the construction of today’s Chapel. At least one of these organs was then removed in 1570 at the orders of the Commissioners of Queen Elizabeth and the pipes were sold by Roger Goad (Provost, 1570-1610). On 22 June 1605, the renowned organ builder Thomas Dallam began work on a new organ in the Chapel. The accounts for his work have survived, showing in detail the materials and hospitality provided by the College while the work was done. The order for this new organ, totalling £370, was considered so important that Dallam closed his London factory and took his men to Cambridge, where they worked for fourteen months. It is believed that around 25 years later this organ was moved from the East End of the Chapel and mounted on top of the screen. Although the Long Parliament ordered the removal of the pipes half a century later, the wooden case was left intact, mounted on what is one of the finest Renaissance screens in the country. Successive re-buildings were undertaken by Lancelot Pease (1661), Thomas Thamar (1673-7), Renatus Harris (1686-8), John Avery (1802-4), and the firm of William Hill (1834, 1859, 1889 and 1911). In 1934 the organ was enlarged and rebuilt in its present form by Harrison & Harrison, with some of the Hill pipework retained and re-voiced. The specification, drawn up in consultation with Boris Ord (Organist 1929-57), included separate mutations on the Choir Organ, unusual in England at that time. Minor changes were made in 1950, when the Pedal Fifteenth and Mixture were added. In 1968 the organ was overhauled and several new stops were provided (11, 12, 22, 48 and 50), four old ranks being displaced. Further restoration work was carried out in 1992, when the console was renovated and the essential repairs took place in 2003 and 2009, during which it became clear that a major restoration would be needed. There is some uncertainty about the history of the wooden case, which is one of the oldest in England. While it has traditionally been thought that the main case survives from the original Dallam organ of 1605-6, it is more likely that only some decorative components may originate from that time. Its current form is more likely to be a contemporary of the Choir case, which dates from 1661. The front pipes were originally coloured and patterned; the plain gilding dates from the eighteenth century. In 1859 the main case was increased in depth to accommodate the enlarged organ, the console being moved from between the main and Choir cases to its present position on the north side. Today, the Great and Swell Organs and the Tuba occupy the main case, facing east; the Choir Organ is at the lower level behind the Choir case; the Solo Organ and most of the Pedal stops are placed within the screen on the south side. In 2016, the organ in King’s College Chapel underwent the most significant restoration since the late 1960s. The instrument is fundamentally as it was designed to be at the time of its restoration in the mid-1930s, but after many years of frequent use it had become unreliable. Major work was undertaken to ensure that it continues to function optimally for the next generation. The organ builders Harrison & Harrison undertook selective work on the organ in 1992, with the intention of prolonging the period before the next major overhaul. In 2003 the company noted that these works were still holding up well, and undertook some minor work to maintain reliability. At this point a report anticipated that a major overhaul would be necessary in 7-10 years’ time, and that this would need to be extensive. This work would include full cleaning, comprehensive re-leathering of the internal actions, and some significant work on the wind system. By 2010 the report was proving to be an accurate assessment: significant problems began to appear, particularly in the leatherwork of the internal action of the keyboards, and the motors. A full overhaul was now necessary to ensure the instrument’s continued operation. A major restoration presented several opportunities beyond just the functionality of the organ. It was the first chance in nearly 80 years to improve the organ’s mechanism and layout. New soundboards and internal actions would result in a quieter and more reliable mechanical operation. Redrawing the layout of the pipes from the ground up would enable the organ builders to move the Pedal Chorus into the main case, which would improve balance and synchronisation, along with a number of other modifications with clear musical benefits. Other changes to the layout would improve reliability by simplifying the technical side of the instrument, and make access for tuning and maintenance safer and easier. A project on this scale would normally result in the organ being out of action for a period of about 18 months. The Chapel’s Christmas commitments meant it would be attempted in just nine months. Well over a year of planning preceded the on-site work, including drawings and the building of a new internal structure at the Harrison & Harrison workshops in Durham. In January 2016, scaffolding was erected around the organ and, following recording sessions for Duruflé’s Requiem, the instrument fell silent. Almost all 4,300 pipes were removed for cleaning and repair; those too large to leave the Chapel were cleaned in situ. After more than 32 years since the last clean, the dust was inevitably affecting the speech of the pipes. Also removed was the entire internal structure of the organ, parts of which would be re-incorporated into the new structure. The console was taken for an overhaul, with the new manuals combining some of the old key-coverings with additional reclaimed material. The empty organ case in the Chapel presented an extraordinary sight. The case was surveyed, cleaned and repaired, and the opportunity was taken to give the entire inside of the Chapel a deep-clean. By April, the new internal structure was being installed. New slider soundboards, with tables and upper-boards using man-made materials, replaced the 1934 soundboards that were susceptible to changes in temperature and humidity. New electro-pneumatic actions were built in to the manual soundboards, and new heavy-duty solenoids were installed for the stop actions. The wind and electrical systems were overhauled, swell box shutter-fronts were similarly overhauled, and new console functionalities were installed—including pedal divide and manual exchange features. With the project proceeding on time, voicing took place over a period of six weeks during the months of July and August, with much of the work carried out by a team of two overnight in a silent chapel. Following the largest restoration project since the 1930s, the organ was up and running again just nine months after it fell silent. Thanks to the work of the builders at Harrison & Harrison and many others, a project that at one point seemed almost too daunting to be even possible had been completed. 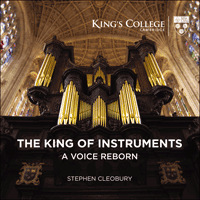 The music on this album was recorded by Stephen Cleobury just a few months after the restored instrument was signed-off, and demonstrates this king of instruments in all its glory. The virtuoso concert organist Simon Preston was a chorister at King’s under Boris Ord and organ scholar under David Willcocks. He was sub-organist at Westminster Abbey from 1962-67 and returned there as Organist and Master of the Choristers in 1981, after eleven years at Christ Church, Oxford. Simon’s brilliance as an organist was summed up by one American reviewer when he commented that Simon was ‘afraid of no work, however formidable, and can do anything he likes with the manuals and pedals, and at any tempo’. Something of that is reflected in Alleluyas, which appeared in an anthology of new organ compositions in 1965. Its extrovert style reflects something of the composer’s character and razor-sharp wit. Alleluya, Alleluya, Alleluya, Lord most high. In 1739 the city of Leipzig celebrated the bicentenary of two significant events in its Lutheran history: Martin Luther himself had preached in the Thomaskirche on Whitsunday 1539, the year in which the city had embraced the Reformed religion. 1539 was also the year in which the Augsburg Confession was formulated. Two centuries later J.S. Bach, by then Thomaskantor, published ‘The Third Part of the Keyboard Practice consisting of various preludes on the Catechism and other hymns for the organ. Prepared for musiclovers and particularly for connoisseurs of such work, for the recreation of the spirit’. The 78-page manuscript contains some of the most complex and technically demanding of Bach’s compositions for the organ. As in Das Orgelbüchlein, written in Weimar twenty years earlier, Bach was producing works which served the practical purpose of furnishing the liturgy with appropriate musical material. Bach had embarked upon Clavierübung III as early as 1735 and it is possible that he delayed its publication until the significant year 1739, not just because of the bicentenary but because of the numerical significance of 39. Clavierübung II had been about ‘two-ness’—contrasting, as it does, two national styles (French and Italian). Part III, in turn, seems to be about ‘three-ness’: the prelude and fugue which open and close the work are both in E flat major, which has three flats, and the fugue has three sections. There are nine chorale preludes based on the Kyrie and Gloria of the Lutheran mass and these nine (3*3) refer to the three of the Trinity in the mass, with specific reference to Father, Son and Holy Ghost in the corresponding texts; six pairs of chorale preludes total 12—a reference to the number of the disciples. And the whole work has 27 pieces—3*3*3— the number of books in the New Testament. At every stage, Bach seems to be pointing towards the central doctrine of the Christian church—the Trinity. In Wir glauben all’, Luther’s version of the Nicene Creed, the melody, published with the text in 1524, is based on the Gregorian Credo IV. This is treated fugally in the manuals, while the pedal repeats in various keys a striding figure, rising in thirds, which has been seen as representing ‘the struggle of faith’. Christ, unser Herr is a hymn about baptism written by Martin Luther in 1541. The melody, which is older, featured in a hymnal by Johann Walter of 1524; it is heard unadorned in the pedals, while the waters of the Jordan are represented by the continuous flow of semiquavers in the left hand. The right hand presents a four-note figure suggesting the sign of the (baptismal) Cross. Kyrie, Gott, heiliger Geist is the third of the Kyrie preludes: in the first, the chorale occurs in the highest part—God the Father—while in the second it comes in the tenor, the middle of the texture—God the Son (God among us). God, the Holy Ghost, underpins everything, and here the melody is in the bass. The manuals provide an imitative texture, thematically based on the plainsong-derived melody. (The Lutherans did not disdain to use prereformation music.) The late Pierre Boulez revered this piece as a fine example of non fugal imitation. It closes on a pedal G with a highly chromatic passage, astonishing even by the standards of Bach. In terms of organ music, Mendelssohn was the nineteenth century heir to the Lutheran tradition represented by Bach and did much to restore the position of the organ which had lost its dominant status particularly in Germany over the course of the previous century. As a boy and young man he travelled extensively in order to play the finest instruments of his day. Bach’s legacy was of the greatest importance to Mendelssohn in all his music-making, but inescapably in his writing for organ. In a letter of July 1839 he urged his sister Fanny to ‘take a look at the C Major Fugue by Bach [BWV545]—I am so much in love with it, yesterday I played it to myself fifty times’. His Six Sonatas for Organ, Op 65, are really collections of movements in related keys, and they do not follow the traditional sonata structure. They originated as 24 individual pieces composed between 1844 and 1845 and were assembled in response to a commission from the English publisher Coventry and Hollier, who suggested to Mendelssohn that he write some ‘Voluntaries’. The first, in F minor, is the most varied; its opening movement presents a fugal texture, interspersed by statements of successive phrases of the Lutheran chorale ‘Was mein Gott will, das g’scheh’ allzeit’. A quiet adagio is reminiscent of his Songs without Words and the King’s musicologist Philip Radcliffe observed that the ‘recitative’ that followed ‘looked back to the early Piano Sonata in E and forward to certain things of César Franck’. It ends with an ‘exhilarating toccata-like’ finale. Harvey Grace was the son of a tailor in Romsey, the fourth of five sons who sang in the Abbey there, three of whom also studied the organ. He went on to become organist of various churches in London, including St Alphege, Southwark, St Agnes, Kennington, and St Mary Magdelene, Munster Square, but by 1925 had become so involved in journalistic work that he decided to free himself from the ties of a church appointment. Blessing, honour, thanks, and praise / pay we, gracious God, to thee. A native of Liège in Belgium, Franck settled in Paris and became Professor of Organ at the Conservatoire, where his pupils included Vincent d’Indy, Ernest Chausson, Louis Vierne and Henri Duparc. A brilliant improviser on the organ, he came late to composition, publishing only from 1872, when he was 46 years old. Pièce héroïque is the third of his Trois Pièces pour Orgue written for the opening in 1878 of the Palace of Trocadéro, built for the World Fair (Exposition internationale) in Paris of that year; this extraordinary building, designed for meetings of international organisations during the Fair, was named after a French victory in southern Spain in 1823, and was therefore strongly Moorish in style. The focal point of the palace was its large concert hall, which boasted the first organ to be installed in a concert hall in France, a four-manual instrument by the great French organ builder Aristide Cavaillé-Coll, whose pioneering technical and aesthetic advances in organ building so inspired composers during the second half of the nineteenth century. Franck himself, as organist of the basilica of Ste-Clotilde, played a Cavaillé-Coll instrument. The Trocadéro was an enormous space and a review of Franck’s performance of his Trois Pièces there complained that the hall was far too reverberant. Since it was written for a concert hall, the Pièce héroïque is not a religious work. It is dominated by the interaction of two major themes—the first, a dark and brooding ‘heroic’ theme, with a restless chordal accompaniment, which will have strong resonances with anyone familiar with Franck’s Symphony in D minor, which he was working on at the same time and completed the following year; the second is a lyrical theme in B major, the tranquility of which is offset by increasingly insistent pedal notes leading to a reintroduction of the main theme and finally to a climax in which both themes battle it out until the second triumphs in a coda, shatteringly stated on the full organ. The Palais du Trocadéro was never popular with Parisians, and was pulled down in 1937 to make way for the modernistic Palais de Chaillot built for the World Fair of that year (where Hitler, notoriously, had his photograph taken with the Eiffel Tower in the background during his brief tour of Paris in 1940, one of the iconic images of the Second World War). The organ, however, survived and, after several major alterations, was eventually moved in 1977 to the somewhat drier acoustic of Auditorium Maurice Ravel in Lyon—a concrete building which is a world away from the Byzantine structure of its first home—where it can still be heard today. The chorale prelude, usually based on a Lutheran melody, is one of the most important genres in organ music, emphasising as it does the organ’s role as a liturgical instrument and, in Bach’s case, reflecting his deeply informed theological approach to composition. Bach is known to have improvised such preludes during services on a regular basis, as many organists do to this day. In producing this collection, he was furnishing the organist with pieces appropriate for various times of the liturgical year, but also had a didactic intent: here was a ‘Little Organ Book, in which guidance is given to an inquiring organist in how to accomplish a chorale in all kinds of ways’. A native of Dallas, George Baker won the American Guild of Organists National Competition in organ playing in 1970 and went on to win many of the major international prizes for the instrument. He studied in Paris with, among others, Marie-Claire Alain, Pierre Cochereau and Jean Langlais, before returning to the USA where he achieved further musical distinctions in the field of academe before deciding to undertake the new challenge of becoming a medical doctor. During all the time that he has spent as a distinguished dermatologist, he has never given up performing, teaching, composing and recording for the organ. In 2009 his Toccata-Gigue on the Sussex Carol was performed at A Festival of Nine Lessons and Carols at King’s. 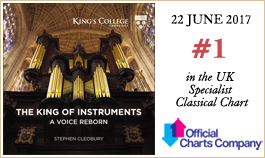 I first played the King’s organ in the late 1960s when I was Organ Student at St John’s College. David Willcocks had asked me to accompany a festal evensong for the Royal School of Church Music which he was directing. My preparation for this included a short meeting with David at the organ console in which he told me that the first two stops I should draw should be the choir to great coupler, since the choir organ spoke clearly and could be heard well from the console, and the 8-foot pedal flute, which was located behind the player on the wall half way up the organ loft stairs. This, he said, would enable me to hear what note I was playing on the pedals! Little did I know then that, some fifty years later, I would be able to have the pedal flute placed inside the main case, and, indeed, by reorganising the interior of the case, that it would be possible to hear the pedal notes with real clarity without the assistance of a sound source on the stairs. As a result of the recent restoration all the ranks on the organ speak with greater clarity and rhythmic precision, and, as these two things were such important features of David’s music-making, I like to think that he would have approved of what has been achieved by Harrison and Harrison in this connection. As I know from reading the correspondence which passed in the 1930s between Arthur Harrison and Boris Ord, Ord was especially concerned with the organ as a vehicle for accompanying the College Choir, and, in many ways, the organ’s great strength is found in this role. It is, perhaps, unsurpassed in the range of subtle colour it can offer in helping singers to paint the words of the psalms, a subtle art which is still very much alive in the hands of our current organ scholars. But the size and versatility of the instrument also enable it successfully to encompass a wide range of repertoire, including the baroque. I have chosen six Bach chorale preludes for this disc, which not only show something of the extraordinary range of treatment the composer brings to this genre, but, in the context of this, the first recording on the restored organ, demonstrate six different registrations, presenting a number of ‘organ pleno’ combinations and, in two cases, making use of the choir mutation stops which are, for me, a special beauty of this organ. The three substantial works in the centre of the programme deploy the organ in romantic repertoire. The sound world of Mendelssohn is inevitably Bach-influenced: the slow movement, however, features a number of the flute registers, including the new 4-foot on the great, and the following ‘recitativo’ contrasts the swell oboe with the solo cor anglais - a contrast not indicated in the score, but which seems effective. Harvey Grace’s dramatic work, a recent discovery for me, allows the player to use the full range of dynamics and colour available, the solo tuba making one of three brief appearances in this disc. (I feel that the effectiveness of this stop is in inverse proportion to the frequency of its use!) Franck’s work is well served by the variety of reeds, as well as by the newly constructed lower notes of the great 16-foot principal. Although not a major feature of the piece, the pedal ostinato in the central section is given character by the second of the new ranks, the 8-foot pedal principal. This has created, for the first time here, a complete principal chorus in the pedal division. The recording begins and ends with music by personal friends and colleagues. In his exhilarating Alleluyas Simon Preston displays a virtuosity as a composer to equal his skill as a player. I am sure he would not deny the influence of Messiaen. It is interesting to reflect that his first recordings of Messiaen were made when he was organ scholar at King’s. George Baker, who lives and works in Dallas, Texas, is a francophile when it comes to the organ. His knowledge of the composers and players, the instruments and the repertoire of the French is not matched by anyone else I know. I was honoured that he wrote this piece for me to play, and this is its first recording.